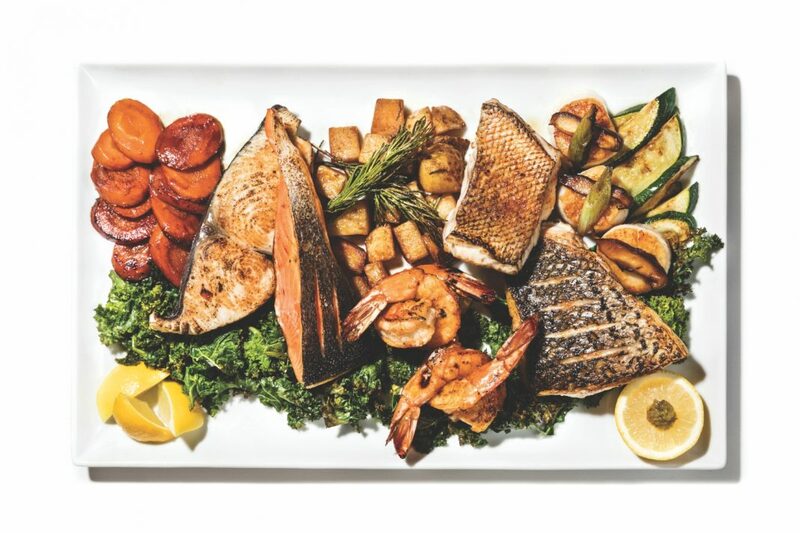 At the Joint in Sherman Oaks, a smorgasbord of fresh seafood lines a pristine 16-foot-long case. To keep his neighborhood fish market and café stocked, owner and chef Liwei Liao visits wholesalers downtown several times a week to handpick selections with sustainability and seasonality in mind. We shadowed the lifelong fisherman on one of his 5 a.m. trips— with stops at Luxe Seafood Company, International Marine Products, and Los Angeles Fish Company—to get a glimpse into how a pro sources prized oceanic goods. Many of Liao’s customers play it safe when it comes to seafood, so he always carries staples. For salmon, he carefully chooses a range, from an economical, sustainable, Faroese farm-raised option to a wild king salmon that swims up the Pacific Coast. “Many people don’t realize that if everyone is eating wild fish, nothing is sustainable,” Liao says. If he carries a farmed fish, it has to be from the “right farm”—one that has a reputation for being environmentally responsible. Liao’s relationship with other fishmongers is built on trust. Guides walk him through their catches and tell him which seasonal options are worth his time. He’ll even dig his hands through mounds of crushed ice to examine a fish’s anatomy, color, and skin texture. Stacks of Styrofoam boxes fill frigid stockrooms, many with tags indicating they were flown in overnight. Liao checks the seafood’s origins: He selects a branzino from Spain rather than Turkey—even if it means smaller fish—because the former has better farming practices. Liao notes the harvest and ship dates on shellfish, never buying any that is more than a week old. “Even though shellfish stays alive for three to four weeks, you lose the brine,” he says.